I’m convinced that Victor Gischler could write just about anything and I would read it. No, really. I mean it. In GO-GO GIRLS OF THE APOCALYPSE (my gateway to Gischler), he writes about a divorced insurance salesmen’s adventures through post-apocalyptic America to get to Atlanta for a showdown that may determine the fate of humanity. This summer Gischler released the novel, STAY, about a stay at home dad who has to call upon his Solo Ops officer training to protect his wife and kids. Then there’s the posse of contract killer circus clowns in the comic book CLOWN FATALE. But what really convinced me that Gischler could write anything he wanted was GESTAPO MARS. Nazi trained assassin, Carter Sloan, is woken from his cryogenic sleep 250 years after being put under. 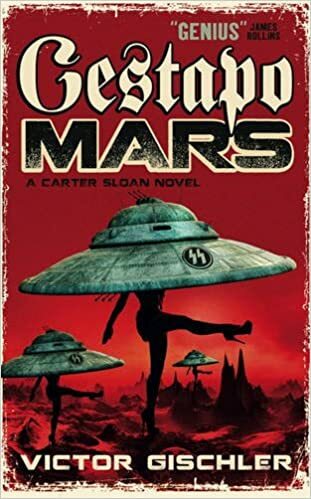 Gestapo Mars is under attack from aliens and rebels, and the Reich needs Sloan’s special skills to help them retain control of the universe. Sloan’s mission is to kill the daughter of the Brass Dragon. And then he’s told not to kill her. And then the mission is back to killing her. He pushes on to find this woman, regardless if he should eliminate her or not. Sloan needs to know what makes this particular woman so important to the Nazi’s and why they want her assassinated (or not). GESTAPO MARS follows Sloan on his journey from a burned out Earth to moons and other planets to track down his mystery woman. Fast with the trigger or with the ladies, Sloan doesn’t let anything get in his way of completing his mission, whatever that mission might be at the time. Gischler has perfectly mashed up everything we love about Buck Rogers with everything we love about Barbarella. While this book is nothing like anything else I’ve read by Gischler, it still feels like one of his books. The book has a serious tone, but Gischler infuses it with humor. For example, Sloan is attempting to make a speedy departure from an abandoned planet with roaming scavengers. His lady of the moment and a family caught on the planet escape on the one operational spaceship. Sloan is forced to use a partially functional postal ship to stage his escape, but the ship’s computer fights with him the entire time. The full startup procedures weren’t followed, repairs on the ship haven’t been completed, and then a missile is fired at the ship. The computer actually cries after being hit by the missile and blames Sloan for all of the damage. I can’t tell you want the computer says to Sloan because my mom reads these reviews, but I can’t tell you it isn’t very nice. And then there’s the scene with the Nazi dinosaurs. That’s right. Nazi. Dinosaurs. Many of Victor Gischler’s books involve a journey of some sort: across post-apocalyptic America, through New York to save the family, across America with the circus, or through space to maintain Nazi rule on Mars. You know that these journeys will be wild rides to where ever they go you won’t want it to end. GESTAPO MARS is no different. And, GESTAPO MARS has the best damn cool cover I have seen on a book in ages. I’d buy the book just for the art, then get all the words for free! Thank you for sparing my sensibilities.